Our Trained Staff will custom build a computer system to suit your specific requirements. 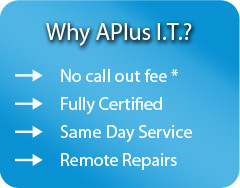 Please feel free to contact APLUS I.T via e-mail or phone. The first step in purchasing or upgrading a computer system is to understand what you are getting! It is, unfortunately, easy for a salesperson to barrage technical sounding details at a customer, making the computer on sale for $999 including 100 free software titles, sound like the best deal in the world and will always be upgradable with the latest technology. This simply is not possible! It is an unfortunate fact that many people purchase computers that are unsuitable for their requirements. Often computers either have many features that will never be utilised by the customer or conversely, don’t have all the features required, resulting in the expensive process of upgrading or changing configurations to suit their individual requirements. Many of these problems arise because the computer industry is full of jargon that can be a daunting task to decipher. Faced with the task of choosing a computer system it is often easier to purchase a “Brand Name” computer from a department store which is pre-built and comes with a range of pre-selected software. However an easier choice is not always a better choice. Many “Brand Name” computers cut costs by using sub-standard peripheral components, have motherboards that cannot accept upgrade components and use cases that will not accept standard components so you are forced into buying (very) expensive brand name replacement components. Building a custom solution for your individual requirements begins with determining exactly what you want to do with your new computer, now; and what you expect to be using it for in six and twelve months time. Once a clear idea of what you need has been developed, Aplus I.T can provide you with a range of options, each with the pros and cons explained. These options also cover other important considerations such as software and future upgradability. Although it may take a little more effort to determine your requirements in a computer system, the result will be a higher quality, faster and much more cost effective system than the purchase of a generic “Brand Name” PC. Once you have a reasonable idea of what goes into a computer you will have a much better idea of what features you will need to fit your requirements. Make a list of what you expect to be using the computer for now and in six to twelve months time. Be realistic with this, if you think you would like to put a few home videos from your handy cam onto the computer, there is no need specifying a professional quality video capture card, but it may be worth the extra expense of getting a normal video card which has the ability to do basic video capture. This one is easy, the bigger and/or faster something is the more expensive it gets. Many computer sales also feature “Bleeding Edge” technology, this means that the component has only just been released and has a huge price premium on it. . The trick to building a computer system is not to invest all your money in one or two components, but make sure you get a balanced system. There is little point in matching a $1,000 video card with a $100 processor – the overall system performance will not benefit. Putting $600 into the video card and $500 into the CPU will probably get you an extremely fast system. Simply contact our friendly team and we’ll take care of you.